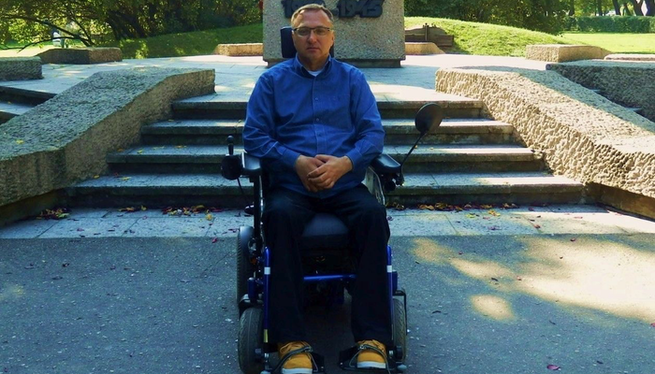 A new wheelchair is the only chance for me to get outside! I dream of becoming part of the world instead of just watching it from a window overlooking the same part of the yard. I don’t know if that’s much objectively. For me, it’s everything. Life has immured me in my house. That is why I am asking for your help. I know there are lots of people in need. I am one of them. I don’t stand out in any particular way, as there’s nothing romantic in my story, no hidden agenda. Just a prosaic tale of tragic outcomes of an accident and the hardships of daily life. And a call for help. Because I couldn’t make it without it. I’ll never walk again, as I’ve had an accident at the age of 20. Spinal cord injury, complete quadriplegia below the sternum. It was a terrifying diagnosis that slowly permeated my consciousness, allowing me to grasp the implications of its timeless effect. For my head was still functioning well. I won’t be able to walk again, I’ll never get up on my own, I won’t be able to move my arms, let alone a finger. I won’t be able to reach for a glass of water. I’ll remain dependent on others to the end of my days. There was no heroic struggle for mobility, as there was no way it could be returned to me. The only thing left was to find how to make life ‘liveable’ again. I started learning how to live all over again. My mum and dad ensured care. Yet, my dad suddenly died, and my mum’s health deteriorated over time. I live in a rural area with basically no wheelchair-friendly facilities. Shortly after the accident, when I returned home from the hospital, I experienced a great psychological barrier. I was embarrassed, I couldn’t overcome my fright and didn’t want to be seen in my village. Eventually, I overcame my internal barriers and with the help of good people with great hearts, I managed to collect the money for a wheelchair I was unable to afford on my own. My road to ‘self-reliance’ was long and tortuous – the first wheelchair proved inappropriate, as it made me topple over many times and cause numerous issues. It was good, but not suitable in my case. I gave the wheelchair to a 16-year-old boy who was trapped in his own house, just as I was. The next wheelchair was everything I dreamed of. I was able to live – to do the groceries, get some things done, see people, help my mum. It allowed me to get outside. I could travel about 40 km on a single battery charge. As the only person in Poland I’ve done over 19,000 km in this model. However, new obstacles emerged. The wheelchair is prone to failure. Over the 7-year exploitation period, I had to have engines repaired (replaced) three times, while the battery was replaced twice. With each repair, I was disconnected from the world and isolated from the environment for many weeks. 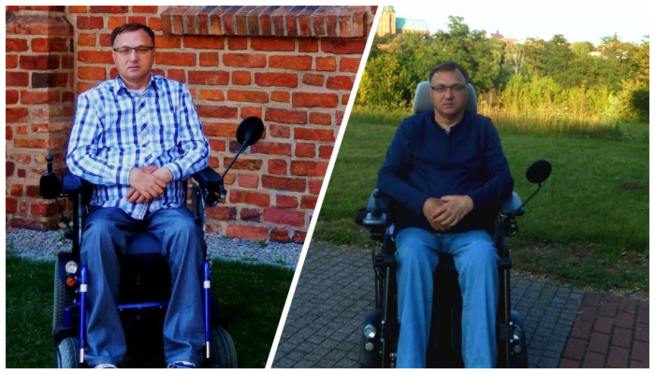 The longest maintenance period took 5 months, since the wheelchair had to be sent to the producer in Germany. For the said 5 months, I was confined to bed. Unfortunately, the wheelchair is worn out to a degree that makes further maintenance and repairs uneconomic and so expensive that I can’t afford it. Does it mean I’ll remain trapped inside my house again? In practice, it all means that I’m immured in my house again. I can move around the house to a limited extent, though not without some effort. However, I can’t move outside at all. As in the first 19 years following the accident, I can’t leave my house. There’s only one solution – a new wheelchair. It has to involve a gyroscope module that allows it to go through crossroads and have a higher turning speed. Moreover, it has to allow me to maintain forward movement close to the edge of the road without having to constantly correct the trajectory of the wheelchair. The footrest has to be electrically adjustable for overtaking kerbs and bumps, while the seat has to be well profiled with angle adjustable backrest, allowing me to adjust it to my needs when sitting in the wheelchair for long hours with no one who could take me to my bed. This type of wheelchair is produced by Ottobock. It costs a considerable sum of PLN 55,000.00. As it is far beyond my financial capability, I thus remain isolated from the world. A mundane obstacle that cannot be overcome? As it sometimes happens, money proves to be a critical resource without which I’m limited to spending my life mostly in my bed for months and years. As a pensioner, I receive pension that barely allows me to cover the cost of medicines. It’s hard for me to make ends meet. A new wheelchair is far beyond my financial capability. I don’t stand a chance to get this money on my own. People dream of going into space, getting a big house, a luxury car, a career in the music industry and professional success. I don’t fool myself with fantasies of becoming mobile again, as I know that I won’t ever be able to stand on my feet or to make even one step, and that I’ll remain paralysed to the end of my days. The only thing I dream of is to be able to live – to sit in a wheelchair, get outside, buy a newspaper and send a letter at a post office by myself. So little and yet so much. The only possible way for me to live more fully again, to get outside and be partially self-reliant, is to purchase the wheelchair. And the only way to purchase it is to seek help from others – people with big hearts. That is why I ask for your help. Please support me in my struggle to win back a relatively normal life and to be able to get outside again.